Just listed: this beautiful used Sea Ray L650 yacht for sale in Florida! 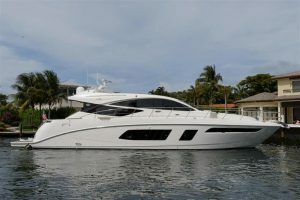 : Atlantic Yacht & Ship, Inc.
Just listed: this beautiful used Sea Ray L650 yacht for sale in Florida! Are you in the market for a beautiful used Sea Ray L650 yacht? Then this used Sea Ray L650 that Stephen Faraldo has for sale is a must-see! In this first place, this used Sea Ray L650 is known as “Something Southern”. As well as the fact that she was launched in 2015. Therefore you know that she shows like the beautiful, young yacht she is. Overall she is powered by twin Caterpillar C-18 1,150 horse power diesel engines. Furthermore with a Caterpillar Premier Passport Warranty until 2021 you know you are good-to-go! This beautiful used Sea Ray L650 is a fantastic and thoughtful boat. She is about the combined experience of true luxury and performance. She is new to market so buy her before somebody else does. This express yacht will not last. Moreover all services are up to date. Similarly this includes a recent bottom job. This yacht has unbelievable power, precision style, and compromised command. For more information on this beautiful used Sea Ray L650 yacht contact Stephen Faraldo today! Just Listed: This beautiful used 85′ Pacific Mariner yacht for sale in Florida! Just listed: this beautiful used 2017 65′ Sunseeker yacht for sale in Florida!